Conceptually, Home is an inviting indie project. It’s a 2D side-scrolling adventure that sees the nameless lead protagonist awaken in a stranger’s house; all he has for company is a torch, which provides a limited but invaluable ball of illumination wherever he moves. His circumstances are a mystery, and with an absence of short-term memory, he’s got little to go on save a pain in his leg and the disquieting sight of a man’s corpse lying in the next room. The game’s chief innovation is that its story unfolds differently depending on how you choose to interpret scenery and key objects along the way. I’m loathed to criticise Home because its ideas, thematics and narrative approach are all laudably creative, and there’s no question we need more adventures in this mould. The trouble is, whilst nearly every element of its build shows promise, nearly every element also ends up feeling unfinished. It never quite achieves its full potential in any single area, and trails similar homebrew outings such as Corpse Party; another one to opt for sprites, a horror theme and divergent fates for its protagonists, only with more fully-realised characterisation and a stronger atmosphere. 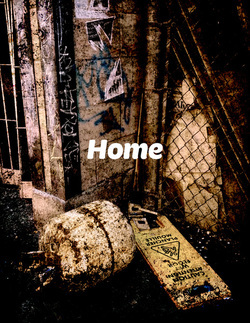 Home’s creator Ben Rivers has stated that the narrative’s ambiguous nature was a deliberate ploy to encourage players to form their own conclusions. It was the smart thing to do given that, depending on what you see, what you miss, what you pick up and what you leave behind, each section can shape your findings a little differently. But it also means thorough playthroughs feel rather unfulfilling; some conclusions you’ll come to seem almost inescapable, yet they’re flatly dismissed in the final reckoning by the protagonist, whereas other mysteries he flags up – such as the role of the dead man who’s found at the beginning – prove difficult to draw clear connections with the rest of the evidence, no matter how hard you try. Here the gameplay is really more of a vehicle used to mobilise the story, with controls streamlined to a one-button system of examining and interacting with scenery, opening doors and so on. Very occasionally, raising the torch up will reveal a new point of interest, but that’s about it. Collecting (or choosing to leave) items is as deep as the interaction gets, with a few tame ‘turn off/on the valves’ bits being the closest it ventures to a puzzle. It controls really responsively, whilst nippy screen transitions help maintain a brisk pace, but the play feels light without more input from the player. "Ah, so that's where I parked it..."
Odd that he needs a torch indoors. Use the lights man! It’s a similar story elsewhere. Home’s low-res, 8-bit pixelated veneer together with the flashlight and graining effect make for a simplistic but pleasant look, as do the door transitions that are kind of how you imagine Resident Evil might have done it if it was a child of the mid-eighties rather than the mid-nineties. It’s all a bit sparse though, lacking the detail and finesse of Lone Survivor, and despite transitioning from houses to sewers, forests and streets, individual locations start to look samey fast. The audio is a bit of a let-down; the bursting of a pipe, the swarming of bats and some screechy door hinges promise much early on, but the sound, so crucial in creating and retaining an atmosphere, loses impetus quite quickly and is largely on the back-burner for the second half of the adventure. It takes between 30 minutes and a little over an hour to finish Home, depending on how meticulous your style of investigation is. I played it through three or four times, as it wasn’t an unpleasant journey to relive and the prospect of different outcomes remained appealing. However, there isn’t necessarily a great deal of difference between the endings, as the final write-up is usually more a patchwork of mini-conclusions based on your findings in each individual location – so ignoring everything and heading for the end understandably causes complete bafflement on the part of your character. Home takes a different tack to your standard adventure game and if you can’t resist a good mystery, it will keep you intrigued for an evening. The lack of scares is a little disappointing for a game that bills itself as horror, and many will wish there was a little more player involvement. Distinctive visuals, crisp sound and smart narrative development all show a lot of potential; it just needs a little more from each to be all it could have been.